How does the Duplicate Constituent Management Tool process? This solution will help to describe the algorithm that is used to determine which records could be potential duplicates when running the Duplicate Constituent Management Tool in version 7.93 and above. The Duplicate Constituent Report in version 7.92 and Import's Duplicate Criteria checkbox use the same algorithm. The Duplicate Constituent Management Tool uses a hard-coded algorithm to determine if records in the database could be possible duplicates. First, the records are put into buckets based on having the same first TWO letters of their Last Name (or Organization Name if applicable), and the same first TWO letters of their First Name (when applicable). In very specific scenarios, the first THREE letters of the First and Last Names are compared. Additional records can be added into those buckets if they meet certain other requirements, such as their Alias and Last Name having the same first TWO letters (or initials, if applicable). After the records have been placed into buckets, different fields on those records are compared to determine if they could possibly be duplicates. The more fields that match, the higher the potential is for those records to be duplicates. Once the records appear on the report as potential duplicates, they are output side by side with information to help determine which is the "master record" if they are indeed duplicates (ex: which one has a greater number of gifts). 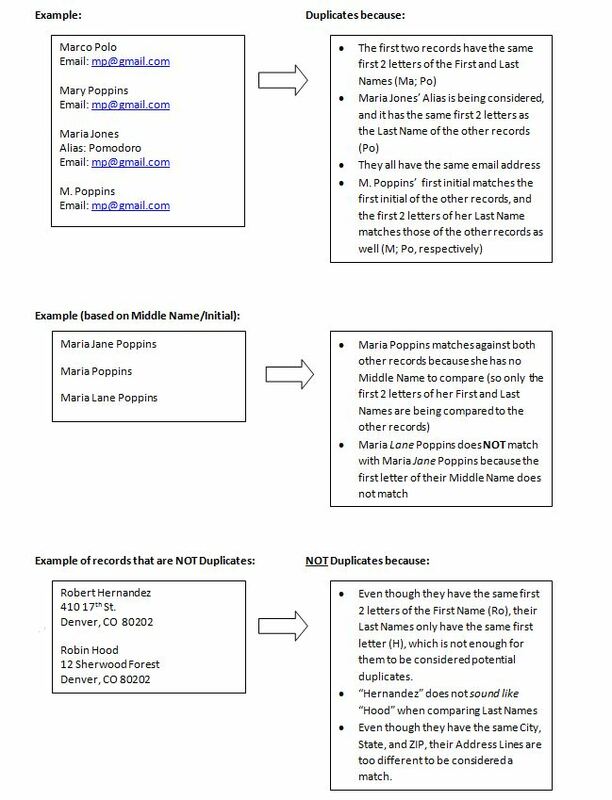 The tool itself does not contain information about what exactly was matched on the records to qualify them as being potential duplicates. Some examples of how the report can process are below. If constituents appear in the results who don't meet the criteria above, see Incorrect results in Duplicate Constituent Management Tool.